Stores reference 22c/827. The frame is in quite good condition, undamaged but with some paint loss/chipping. Both frame nuts are original. The leather surround is in very good condition, the backing chamois is extremely clean and the nosepiece leather remains pliable. Fitted with a decent set of clear glass lenses. The webbing strap is rather faded, a bit stretched and lacks elastication but the metal componants are largely free of rust and verdigris. 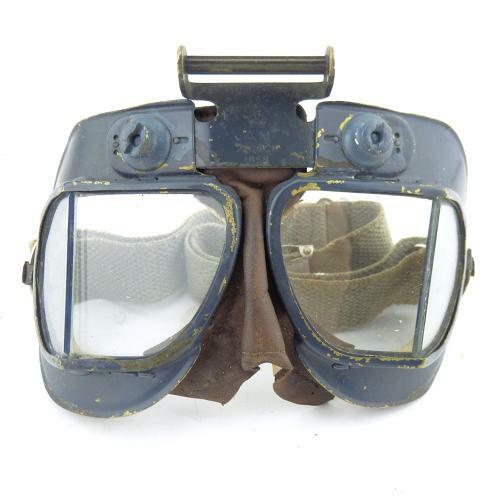 A reasonably good used pair of goggles suitable for both RAF and USAAF displays. No antiglare 'flipshield' fitted. Stock code G22219.